Sleeps 8 – 2 king-size with en-suite, 1 twin, and 1 bunk room, 2 family bathrooms. One downstairs w.c. The ground floor is open plan with kitchen and dining areas, and a sitting area with a separate “snug” room with its own DVD player. 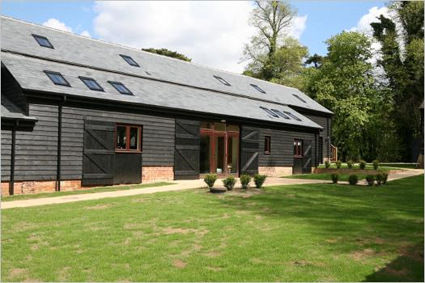 Vancouver Barn is the middle section of a converted Suffolk barn tastefully and sympathetically converted into luxury holiday accommodation in an area of Outstanding Natural Beauty close to the Suffolk Coast and River Deben. Originally a five-bay weatherboard barn with slate roof, the conversion has kept all the character of this former working agricultural barn with exposed structural timbers and timber board roof. The main dining table will seat 18 people and is made from wood sourced on the estate as is the large coffee table in the sitting room area. The downstairs open plan design is ideal for family gatherings with its large comfy sofas and small snug room if the children want to settle down to a DVD of their own. The kitchen area is separately defined but is designed so any “chefs” are not left out of any group discussions whilst making the most of this well-equipped facility. Upstairs are spacious bedrooms with top quality comfortable beds and luxury bathrooms. Linen and towels are included. Outside, a terrace with table and chairs, with a lawn and old cart sheds which house a table tennis table, and BBQ’s. A laundry room has a washing machine, dryer condenser, iron and ironing board and drying area. The sitting area itself has sofas, low-rise table, arm chairs, large-screen TV, DVD, and Free-view. Log burning stove with moveable safety guard. The king size room to the left has two bedside cabinets and lamps, and chest of drawers. Ceilings are vaulted and open up to the underside of the roof. It has an en-suite shower room with a built-in cupboard with movable shelves, double sized shower, wash basin, w.c. and heated towel rail. A second master bedroom has bedside tables with lamps, and a chest of drawers. The en-suite has a double shower, wash basin, w.c. and heated towel rail and built-in cupboard with moveable shelves.